Seasons may come and seasons may go, the earth may tilt further on its axis, the leaning tower of Pisa may lean a bit too much than required, there maybe evidence of life on mars or water on the moon, all these things may or may not happen, but there will not be Christmas without cake. Like peas in a pod, like co joined twins, like flowers in spring such is the love that Christmas and cake have for one another. What would all the merry making and jubilation do if they couldn't be doused in a glass of wine and a piece of cake? From its humble beginnings of being served in all its naked glory, to being dressed up like a shiny star upon a Christmas tree, this confectionery has come a long way. But dress it up or down, douse it with a generous helping of liquor or not, the plum cake or fruit cake is quintessentially a part of Christmas day. This cake was extra special this year, as it not only heralded the festival of merry making and good cheer, but also doubled up as a milestone birthday cake for my better half. We had a little brunch with few of our friends at home, and celebrated his belated birthday and early Christmas, which started off with some light sparkling wine with tropical notes, followed by a dreamy creamy bake and finished off with this delectable beauty. To say that the cake was happily devoured by all our guests would not only be an understatement, but also rank me way down on the humility meter. So without blowing my own trumpet any further, lets checkout the recipe folks! Makes: One generous half kg cake. Start by creaming the butter and both the sugars till light and fluffy and pale in colour. Next add in both the eggs and whisk well. Now add in the vanilla and 1/4 cup rum and mix. Now add in the fruits and nuts which have been soaked in rum for a minimum of two hours or even months ahead. To the prepared batter add in all the dry ingredients and fold in gently. Allow the cake to cool in the (switched off) oven for 10 mins (with the oven door slightly ajar), before transferring onto a cooling wire rack to be cooled till it reaches room temperature. Store the cake in an airtight box. After about and hour of cooling down, pour the juice of one orange over the top of the cake, allow it to soak up the juice over night. The next day pour 2 tbsps of dark rum over the cake and allow to stand for a few hours. 1. 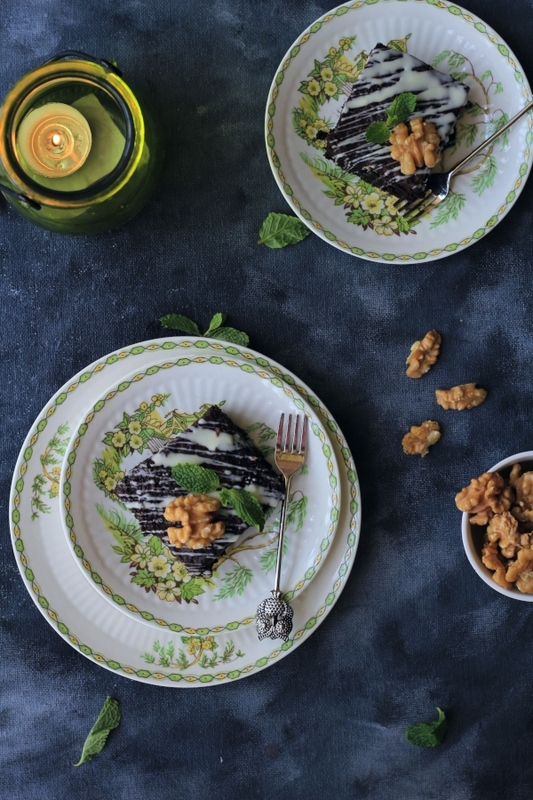 Place a few strips of baking paper on the sides of a cake board. 2. Place the cake in the center of the cake board and brush with apricot jam, that has been slightly thinned by adding a little hot water. This will act as the glue for the fondant to stick on. 4. 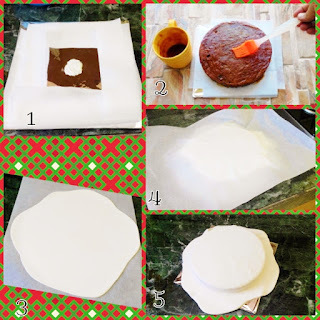 Place the rolled out fondant over your cake, with the help of your baking paper. 5. Remove the paper and smoothen out the fondant on the top and sides with your hands. 6. Once satisfied cut off the excess from the sides. 7. Add a decorative ribbon to cover harsh edges at the bottom. 8. Add cake toppers of your choice and serve. This is so gorgeous !! Want to eat all of it at one go..